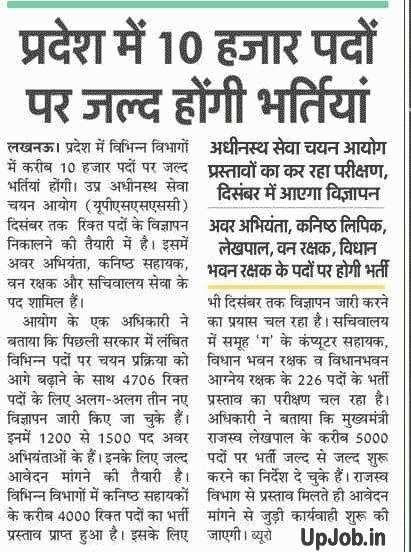 Rajsav Vibhag Uttar pradesh now going to to publish the official recruitment notification for inviting application form for the posts of Lekhpal. All those candidates who hold the eligibility criteria they can fill application form in prescribed application form format. Official advertisement for Lekhpal vacancy of Uttar pradesh Rajsav parishad is publishing district wise. Board of Revenue of Up will monitor all recruitment process. UpJob.in brought a exclusive job notification of Lekhpal bharti 2018. Application form submission process will be started from December 2018. All those candidates who want fill application form for Lekhpal recruitment they can fill application form till the last date which is January 2019. Selection of the eligible candidates will be based on through the written examination Only. Written exam will be held in the last of February 2019. Written test of will carry 100 marks. All intermediate pass candidates can fill application form for Lekhpal. This is of the best Job opportunity in government sector for class 12th qualified students. Minimum age should be 18 year and maximum age will be 40 year as on 1st July 2018. Candidates are required to pay rs 300 application form for genera and OBC category, and rs 150 for all other category. Fee will be deposited through E Challan form in the favor of District magistrate. Last date of fee submission is January 2019. Selected candidates will be appointed in the pay scale 5200-20200 and grade pay of rs 2000. Salary : 5200-20200 and grade pay of rs 2000. Eligibility Criteria: Education qualification: Intermediate from Madhymik siksha parishad UP or Its equivalent. Age Limit: Age Limit minimum 18 year and maximum 40 year as on 1 July 2018. Selection Procedure: selection of the eligible candidates will be based on though the written examination. First of all a written examination will be held for all eligible candidates. Written test will carry 100 marks. According to official notification written exam will be held on end of February 2019. Candidates have option for selecting the written examination centre for lekhpal recruitment examination. you can select 3 district for the written examination. Application form fee: interested candidates can fill application form through the E Challan form of SBI. Candidates have option of paying application form fee through the Debit card, credit card, Net banking. Application form fee will be deposited in Favor of DM, Through E Challan form. Application form fee will be deposited through Online Mode. Which documents are required to rajasva Lekhpal interview? ?